A native of the Andes, the cherimoya has long been a thing of fascination fo the moche culture of Peru where cherimoyas are more often than not, depicted in ceramics. The fruit which is quite similar to the custard apple is more commonly found in the Andean-highland valleys of Colombia, Ecuador, Peru, Bolivia and Chile, growing in small shrubs. Just like the custard apple, the cherimoya is oval and grows to about 7-10 centimetres in diameter. 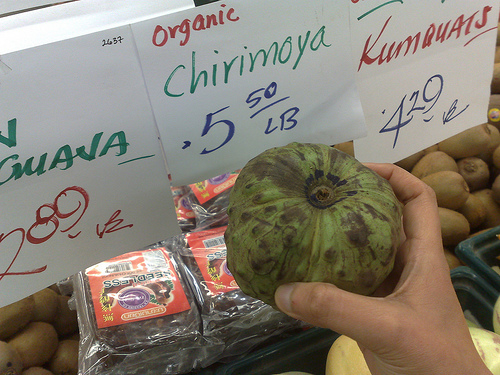 Origins of the name “cherimoya” can be traced back to the Quechua word of chirimuya which literally means, “cold seeds”. 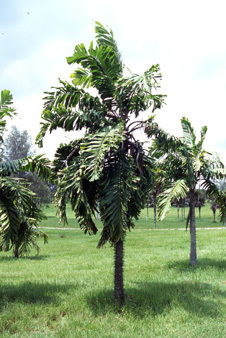 This is due to the fact that the cherimoya shrub will only germinate at high altitudes. A rather appropriate name I would say. What do the flesh of cherimoyas taste like? It can be said that they have a fleshy and soft flesh with a sherbert-like texture. Others have characterize the fleshy bits of cherimoyas as being a blend of banana, papaya, pineapple, strawberry and peach. 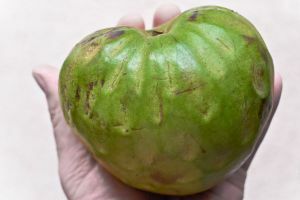 Mark Twain had once famously said of the cherimoyas as “the most delicious fruit known to men.” The size can easily be compared to that of a grapefruit with dark seeds that are glossy. However, seeds from cherimoyas are poisonous and when crushed open, can also be used as insecticide. Extraction from the bark of a cherimoya tree can induce paralysis upon injection. Like the avocado, cherimoyas will yield to slight pressure and fruits that are cracked or brown should be avoided at all cost as fresh cherimoyas are green in color. It is important that unripened cherimoyas are bought to allow these fruits to ripen at room temperature until it is ripe. The pollination of cherimoya flowers are interesting as the flowers are hermaphroditic and as short-lived flowers, open as female before progressing to being male in a few hours. Beetles are suspected to be the natural pollinators of cherimoya flowers and not bees because bodies of honey bees are too large to fit in between the petals of cherimoya flowers. One can gather the gender of cherimoya flowers based on the width of petals. When the petals are partially separated, they are female flowers and when the separation is at its widest, they become male flowers. This form of pollination are known to work only in its land of origin. When cherimoya flowers are cultivated outside its land of origins, cultivators would have to rely on wind to pollinate these flowers. To complicate matters, cherimoya pollen are known to have a short lifespan. Harvesting for cherimoyas are typically between January through June. Cherimoyas are very versatile and can be used in a variety of recipes, notably in the making of smoothies, daiquiri, salads, ice cream and pies. In a single serving size, cherimoyas are a rich source of vitamin C, niacin and calcium. When eaten on its own, cherimoyas should be served chilled or frozen and eaten as ice cream. As demand has greatly exceeded the supply of cherimoyas, most fruits would never leave the only cherimoya-producing state, California.